If you saw my previous post about the mantel this year, you know my theme for 2013 is Woodland Christmas. This year is definitely one of my faves ever! I looked to nature for inspiration (and for a lot of the supplies), using birds, feathers, twigs, pine cones and moss. 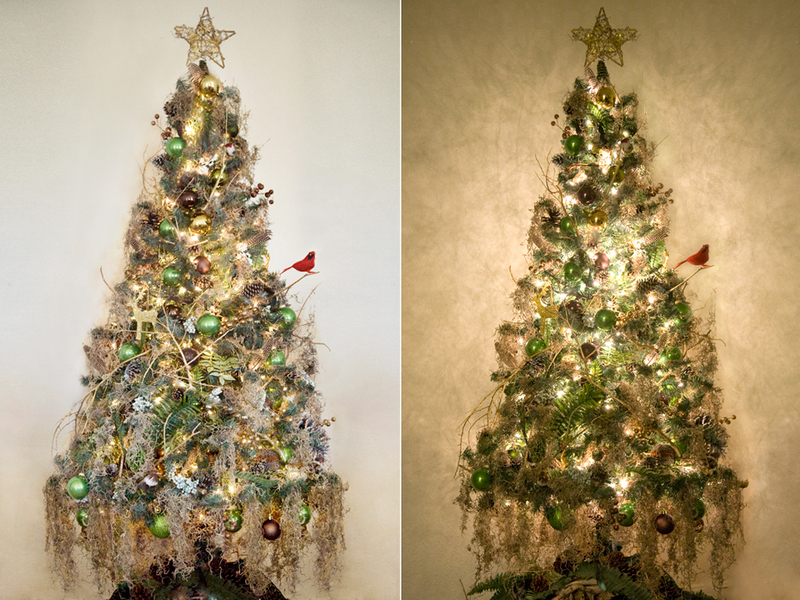 I’ll give you a summary of this year’s process but if you want the full Kindra course on Christmas trees check out last year’s snowy post here. We started with lights (thanks Dad and Rosi for your light expertise! ), as always, and then added green, brown and gold ball ornaments toward the inside of the tree. I spray painted several branches and twigs gold and layered them on top of the trees branches, wrapping them around the tree’s shape as much as possible. Next, we nestled in dozens of pine cones, feathers and ferns, ending with little birds and a few other ornaments. Then came the moss. Lovely moss! Kind of creepy in a way but in a good way, I think, adding a sense of age and enchantment. The phrase of the day was mas moss- I couldn’t get enough! As opposed to the mantel’s reindeer moss, on the tree I used the Spanish variety. I carried the theme on underneath the tree, too, covering the base with ferns, pine cones and gold branches. There’s just something comforting and homey about Christmas tree glow, don’t you think?